More Fun #99 (September 1944) - The Smoking Volcano! Aquaman and his fishy friend Goo-Goo Eyes discover a crooks hideout disguised as an active volcanic island. We get two new named finny friends in this story: Goo-Goo Eyes, who is an unidentified species of deep sea fish, and Saw-Nose the Swordfish. Cool!... 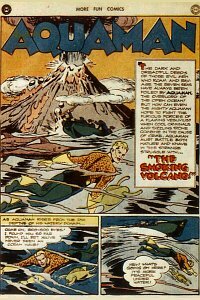 Aquaman figures out that the volcano is fake when he finds the cooled lava is street paving tar... Aquaman is stunned by the fake volcano, and very impressed... Aquaman uses the volcano's smoke maker to send the S.O.S. signal. I wonder how many cops are paying attention to the smoke of a presumed volcano? ... The turtles attacking the Duke's gang look really mean. Finny Friends Report: Aquaman is showing the upper reaches of the ocean to Goo-Goo Eyes when the story starts. Goo-Goo helps Aquaman find a channel into the volcano. When Aquaman is captured, Goo-Goo goes for help and brings back Saw-Nose the Swordfish and his mate who free Aquaman. He sends the Swordfish and Goo-Goo to get more help, and they bring back iron-beaked turtles, who battle and defeat Duke's mob with Aquaman's help. Captured/Knocked Out report: Aquaman is spotted in the cave thanks to his "gleaming costume and golden hair", and netted in a steel net by Duke Flarer. Quotefile: Aquaman, directing his army: "Clinch their hands! Their clothes! Hand on to them, turtles!"